Another read-a-thon...how can I resist! 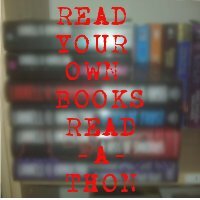 The Read Your Own Books Read-a-Thon is being hosted by Monica at The Bibliophilic Book Blog. - GIVEAWAYS (DUH!?!) I personally am giving away a Nook original in a cover. I am also giving away multiple audiobooks and whatever else strikes my fancy. In order to enter the giveaway for the Nook you must participate....it will be finished when the read-a-thon is over. So...start planning. I am participating too. Are we suppose to update our progress everyday? I don't see it where it says when to update?